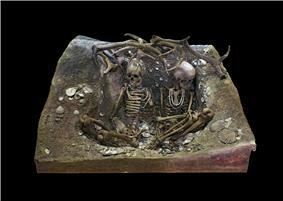 In archeology, mesolithic (Greek: mesos "middle", lithos "stone") is the culture between paleolithic and neolithic. The term "Epipaleolithic" is often used for areas outside northern Europe but was also the preferred synonym used by French archaeologists until the 1960s. In the archaeology of northern Europe, for example for archaeological sites in Great Britain, Germany, Scandinavia, Ukraine, and Russia, the term "Mesolithic" is almost always used. In the archaeology of other areas, the term "Epipaleolithic" may be preferred by most authors, or there may be divergences between authors over which term to use or what meaning to assign to each. The Paleolithic was an age of purely hunting and gathering while in the Neolithic domestication of plants and animals had occurred. 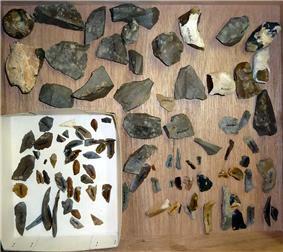 Some Mesolithic peoples continued with intensive hunting. Others were practising the initial stages of domestication. Some Mesolithic settlements were villages of huts. Others were walled cities. ^ Bar-Yosef, Ofer (1998). "The Natufian Culture in the Levant, Threshold to the Origins of Agriculture" (PDF). Evolutionary Anthropology 6 (5): 159–177.